Most people have a LOT of photos. You may have photo albums from your childhood, boxes of loose photos of your parents or grandparents, and scrapbooks you made when your kids were little. And then with today's digital age, most people have thousands of photos on phones, camera cards, laptops, old computers in the garage, hard drives, CDRoms, memory sticks, in the cloud, and a host of other places. It's great to have access to so many photos. They are filled with memories of people, places, and events in our lives. But when we have SO many photos, it's hard to enjoy them. We can't find the good ones because they are buried among thousands of other photos that aren't as good. If you need more motivation to get your photo collection under control, think about how safe it is in the state it's in now. Are your digital photos backed up well and in multiple places? If not, you're at risk of losing them if you have a technical problem with any of your devices. Are you printed photos protected from potential damage? Cardboard boxes won't protect them if you have a flood or a pipe bursting in your home. If a natural disaster hits your area, how many of your photo albums can you save? And while we're talking about photo albums, did you know those old magnetic or sticky albums are actually causing your photos to deteriorate faster? The thing is, we know we should do something with our photos. But it's never as high on the priority list as all the other more urgent tasks in our lives. And as our collection just continues to grow (exponentially! ), it gets more and more overwhelming to even think about going through and purging some. Let's face it, no one has days or weeks to set aside to sort through their photos. But just like with the 365 Items in 365 Days decluttering challenge, if you do a little bit every day, it isn't as overwhelming. And it all adds up! That's my vision for this month. That we each would set aside some time every day (how much is up to you) to take on our photos. Depending on how much time you devote to this challenge, and how big your collection is, you may not declutter your whole collection in one month. But if you do a bit every day, I promise you, you will see progress and it won't be as overwhelming to continue working on next month. Just like with the 365 Items in 365 Days challenge, this one will be very flexible. No big rules to follow. No huge targets to attain. I'll write a post each day with some tips and then I'll share how I'm doing with my decluttering. We're in this together! You can decide whether you'd like to declutter printed photos or digital photos this month (or both). 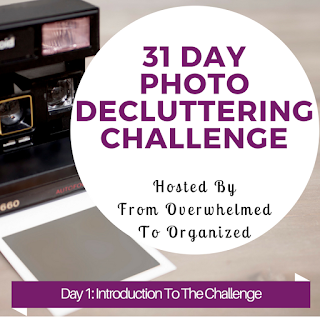 I'll be sharing tips for decluttering both types of pictures throughout the month. All I ask is that you do some decluttering every day this month and then tell me about it. Some days you may be able to do more than others and that's fine. But do a bit every day so you see your progress and build your momentum. You can leave a comment on the blog posts, or on any of the social media sites I share them on, to let me know your goals and share your progress. Or join the 365 Items in 365 Days FB group where lots of us will be participating in this challenge this month. We'll all encourage each other and hold each other accountable so we are successful! My primary goal this month is to go through all my photo albums. I haven't counted them all yet, but I have albums from my childhood and young adult years, albums from the early years of my marriage, and albums from the early years of both of my kids. I stopped printing pictures after that because I was running out of space for all the albums I had. I decluttered some of my albums and printed photos 4 years ago during The Great Photo Purge Challenge, but I still have a lot of albums. During our recent move I realized just how many photo albums I have and how much space they take up. So I promised myself I would deal with them and this is the month I'm doing it! I also decluttered lots of digital photos during that challenge 4 years ago, but my digital collection has grown tremendously since then. So while my primary intention is to work through my printed pictures, I also plan to declutter some of my digital pictures this month (and beyond). I'll go into specific numbers and goals in future posts. Today's task is to decide whether you are going to declutter your printed pictures or your digital photos. Let me know what you decide! I also want to know, what's your motivation for decluttering your photos? What do you think will be most difficult this month? If you're ready to jump in and get started, then go ahead and start decluttering some pics. Tips will start tomorrow but I'm sure you know some photos that you can declutter so start with those. I'll have a printable to track your progress in a few days but for now just keep a count somewhere so at the end of the month you'll be able to see how much you've accomplished. Backing up your digital storage is so important. I lost 3 years worth of pictures including: the day our entire rose bed bloomed at once, my daughter's experience as Fair Ambassador competitor, 2 Christmases, pictures of our first pet being "helpful",.... So many I only realized were gone because I went looking for them.... My entire hard drive "chewed" itself to bits and I lost the year's worth of both sets of books I kept for our church and charge and the new job I'd started.... I could recreate the bookkeeping and the records for my job BUT the photos were gone! So I'm sorting my digital photos and making sure their are backed up and ready to be printed. I'm so sorry you lost all those photos Suzzy :( Things happen with technology that we can't always control so it's so important to have good backups. 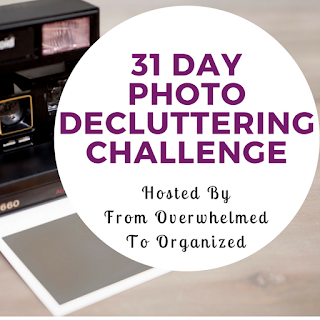 Good luck through this month getting all your photos organized! We asked if anyone else (his sibs or cousins) would be interested in them... NO! .. It's really sad .. but we have 8 HUGE boxes and about 12 photo albums to look thru to see if anyone recognizes any one or place ... This does NOT include all of our photo's ( 50yrs worth! ) But this experience has forced us to try to take care of this... Thank You for the Challenge!!! It's sad when we can't identify people or places in old photos. Makes it even more important to sort through and organize our photos so we can pass them down with identifying information and even some stories. Good luck sorting through all your photos this month! I think I will focus on Digital Photos. I know there are plenty to delete. But they are in several areas. I also need them them a bit more organized, such as by month and year. Some are Novemeber_2015, others are 11/2015. I want consistency in naming! Consistency definitely helps with staying organized and makes it easier to find them back. Good luck decluttering your digital pics this month! I am also going to declutter my digital photos. One of the first things I want to learn is how to back them up on the cloud. I want to declutter them so I can access them better and more often. ANd I want to make some photo books from these photos. I LOVE how organized your post is and how easy it is to see (b/c of subheadings) how this challenge will work. Thanks for sharing your Pinterest link. I am now a follower. I am here from #Write31Days. I am doing a decluttering challenge so I look forward to seeing where your links will take me. Welcome Susan! I'll check out your challenge too. My end goal is to make some photo books too. Good luck decluttering your photos this month! Great to "walk through the trenches" with readers on this, Hilda. Photos is one item that is overwhelming almost everyone these days! That's the advantage of being a blogger :) I picked this challenge as much for me as for my readers because I really need to focus on this. I'm going to declutter my childhood albums and scan them into the computer. I have several albums from when I was a baby through college and beyond. It would be nice to have the collection digital so I could share them when I want. That's exactly what I want to do Sabrina. And the bonus is that those photos can be backed up in case anything ever happens to them. Good luck decluttering your albums!